I’m a glutton for punishment. 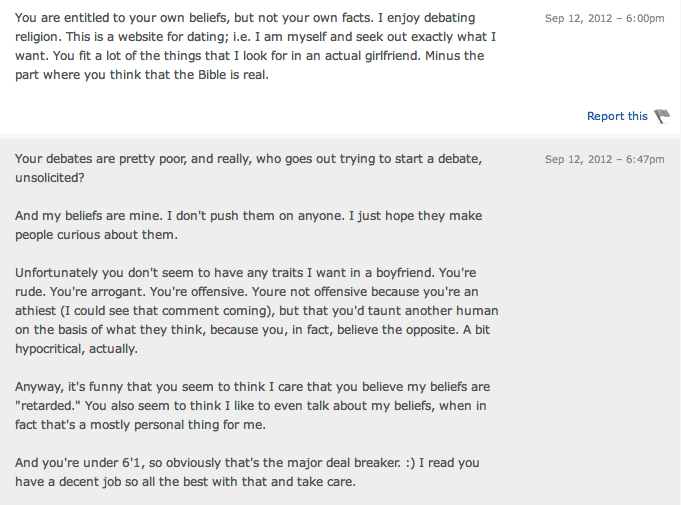 I take that back: I’m a glutton for watching others be punished, which is exactly what happens in online dating. Although I took myself off OKStupid OKCupid, I’m back. For dating? No. For blogs? Yes. And the messages are better (or worse, depending on how you look at it) than ever. You know how these work: I leave out usernames and photos, because I’m not a life-ruiner. I’m more of a Carly Simon, “I bet you think this song is about you” kind of gal, instead of a Taylor Swift “guess which song is about Jake Gyllenhaal” kind of lady. Maybe someday I’ll tread into Swifty territory but for right now I think keeping things anonymous = good karma. OKC is anonymous, but let’s be real here, I’d respond the way I do to some of these creeps without hiding behind a screen name. I don’t respond to messages unless the guy really pisses me off. 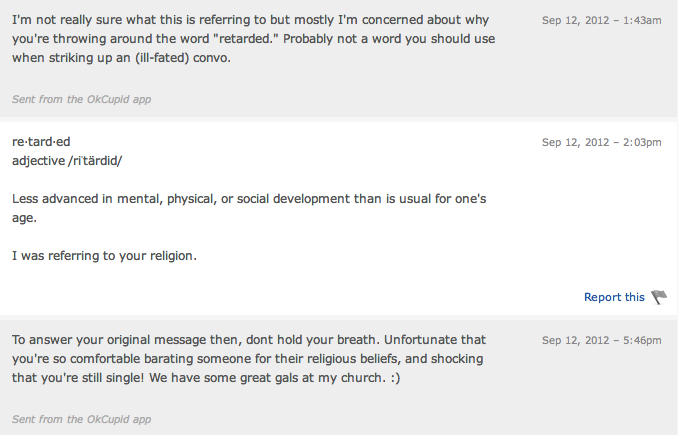 This guy was offensive on so many levels that I just… well, just read. I’m so utterly confused by this message. Is he calling me uncool? We have a pseudo-connection based on our (poor) Match percentages, but it’s not as good as his connection with this sister? I’m so lost. I think he meant well, but it turned out a little too much like a Honey Boo Boo reference for me. If you happen to have extra time to make a fake account on OKC and then use that line as your opener… you shouldn’t be dating. The thing about OKC that I will never understand is why men post photos from behind, in the dark, with their faces covered; while they’re white water rafting from 20 miles away; posing with an ex-girlfriend, taking shirtless selfies in the bathroom, etc. Just. don’t. get. it. Those photos are not attractive, sometimes are fully embarrassing, and somewhat of a sham, considering most people would like to see what the other looks like, given they can’t be there in person. Guys, do everyone a solid if you’re really trying to get out there and date and post a decent photo of your face. But MAN. Aren’t photos deceiving? I have plenty photos of myself where I look like I’m 5’9 and could possibly be 20 pounds lighter, when in fact, it was a great camera angle and superior lighting. Ladies and gents, don’t pretend you don’t have those poses down to a SCIENCE. In our Facebook-dependent society, knowing how to take a proper photo without looking cross-eyed, frumpy and double-chinned is a skill. A SKILL! Regardless, it’s nice to have a reminder of why I’m happily single.